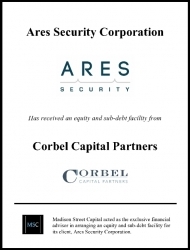 Chicago, IL, January 10, 2017 --(PR.com)-- International investment banking firm, Madison Street Capital, acted as the exclusive financial advisor in arranging a minority equity and subordinated debt investment for its client, ARES Security Corporation. Based in Vienna, VA, ARES Security Corporation is a leading enterprise security risk management company that provides comprehensive end-to-end security software solutions. The minority recapitalization was provided by Corbel Structured Equity Partners. The transaction was announced today by Charles Botchway, CEO of Madison Street Capital. The transaction was led by Madison Street Capital Senior Managing Director, Reginald McGaugh. Ares determined that working with Corbel to creatively structure the investment was the best path toward creating significant equity value. Corbel’s flexible capital solution and operationally-supportive partnership will enable the Company to continue its significant sales momentum and capitalize on new revenue opportunities within Corbel’s deep bench of industry contacts. Madison Street Capital is an international investment banking firm committed to integrity, excellence, leadership and service in delivering corporate financial advisory services, merger and acquisition expertise, financial opinions, and valuation services to publicly and privately held businesses. These services position our clients to succeed in the global marketplace. In undertaking each new project, the client’s goals and objectives become ours, ranging from financial advisory and successful capital raises to M&A transactions to transfers of ownership. Madison Street Capital views emerging markets as the core component driving the global growth of our clients, and will continue to focus significant assets on these markets. Our firm has earned the trust of clients around the world through our unwavering dedication to the highest levels of professional standards. For additional information, please visit our website and follow us on Twitter and LinkedIn.